The Overview page displays information about your current and future marketing campaigns, as well as the growth of your subscriber base. You will also find links to create new campaigns or manage your subscribers directly from the Overview page. The What's new section will keep you up to date on the latest features in GoDaddy Email Marketing. If you do not want to see the updates, you can click on the X in the top right corner of the What's new section. Note: If you dismiss the What's new, the What's new section will appear the next time a new feature is integrated into your GoDaddy Email Marketing account. In the Campaigns section, you will be able to track the views from the last 30 days. If you would like to compose a new campaign, click Create another campaign to get started. For more information about composing a new campaign, please see Create your first email campaign. You will also be able to track the progress of your recently sent campaigns. You can view the contents of any of the recent campaigns by clicking on the name. If you want to get a better look at the performance of an individual campaign, click the Stats link. For more information about GoDaddy Email Marketing statistics, please see Check the stats of your campaign. You can see all of your scheduled campaigns as well. If you need to make changes to a future campaign, click Edit next to the campaign you want to adjust. To learn more about future campaigns, please see Schedule a campaign to send later. Note: If you would like to visit the Campaigns page, simply click on the Campaigns heading. The Subscribers section displays your total number of subscribers, which includes the subscribers you have imported into your account. The number of new signups will display how many people completed a signup form in the past 7 days. Note: If you have double opt-in signup in place, new signups are counted when a prospective subscriber completes a signup form, then clicks on the link from the confirmation email. For single opt-in, subscribers are added upon completing the form. Please see Double opt-in for more information. 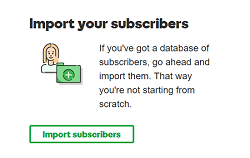 If you have an existing database of subscribers, click Import subscribers to add your subscribers to a new or existing subscriber list. For more information about importing a subscriber list, please see Add subscribers by uploading a file. Note: If you would like to visit the Subscribers page, simply click on the Subscribers heading.